Next time you're interested in setting up a field trip for you and your children, why not consider combining a trip with a volunteer opportunity. Begin by performing an online search to see which organizations near you are in need of volunteers. Once you have found a location, contact them. Explain your interest in volunteering for their organization. Make sure you find out what their age requirements are. Then find out if it would be possible for someone to give you and your children a tour of their facility so that your children can learn how their organization operates, including how they meet the needs of those individuals they serve. This would offer your students a great opportunity to experience first-hand how many needs are out there, and how they can play a pivotal role in fulfilling those needs. Let me share an example of our experience as we recently did this with another family. 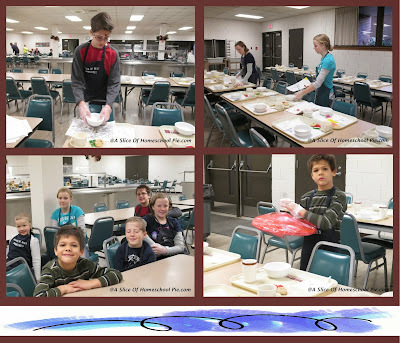 Both of our families came together to help prepare for lunch at a local ministry called Haven of Rest. We brought Christmas cookies which various homeschool families and friends had baked, and decorated the trays with place mats which several children had decorated. Once we were finished, we were able to tour their facilities. 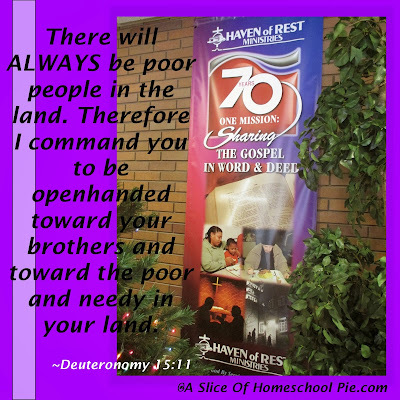 Haven of Rest Ministries was founded in 1943, and is currently celebrating their 70th year anniversary. They serve the homeless by providing them with food, shelter, clothing, and the message of Christ. Five meals are provided a day, seven days a week (about 600 meals per day). They also provide these individuals with various job skills training. One of our first stops during the tour is pictured below. Here we learned about the history of the ministry and the various programs they offer. Learning about the various outreach programs Haven of Rest Ministries provides. Before the people receive a meal, they must first attend a service in the facility's chapel. The women live in a separate building, pictured below. I believe the day we visited they had about 11 children staying at the facility. Below is a photo of a bedroom where the children sleep. As you can see below, each child receives a stuffed toy which is provided through donations. This is a photo of the ladies' bedroom. Everything was neat and orderly and each individual that stays in this facility has various chores that help keep everything tidy and clean. As you can see below, the men's quarters have more beds. There are instances in which there are more men then beds available. When this occurs there are extra cots that are laid down on the floor to accommodate them. This whole experience offered us a great field trip opportunity and allowed all of us to see the needs of others first-hand, and how we each of us can make an impact in people's lives. So next time you plan a field trip, see how you can use the experience to reach out to others. 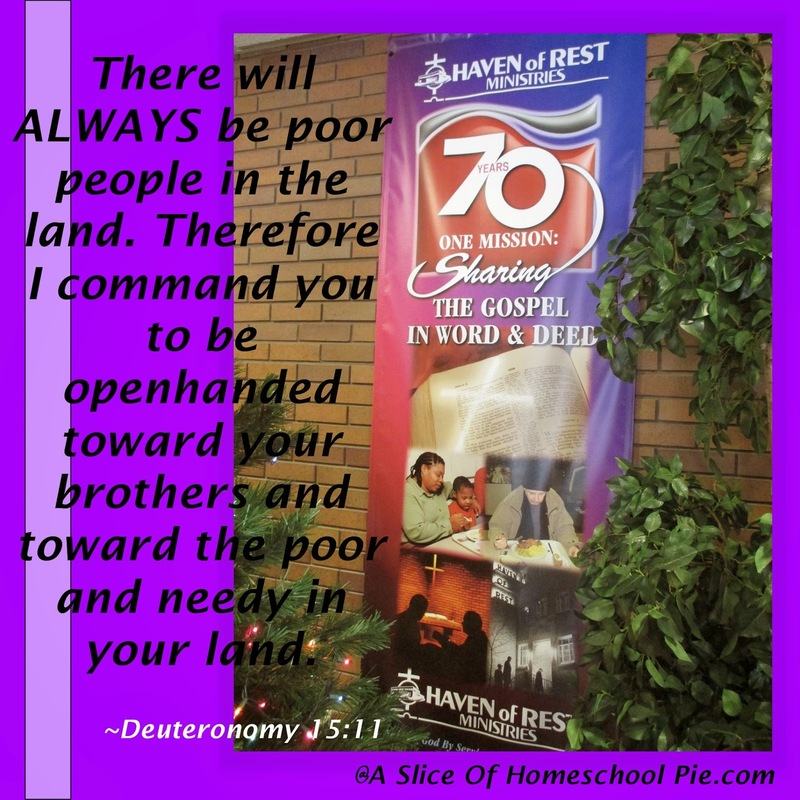 Note: If you live near the Haven of Rest Ministries, they are always in need of volunteers. Call them as I'm sure they'd love to hear from you. Thanks again, Clara, for inviting my family to join yours in serving. It was a blessing to us all. I was really glad your family was able to serve with us. It really made it fun, didn't it?